Some people buy a vehicle as a disposable appliance – a sheer means of transportation to get from A to B. Others hold their vehicles so near and dear that they’ll rebuild them – twice – after catastrophic collisions. Where do you fall within that range of car owners? One of my favorite things to do on rare weekends when I stay in town is to visit the local Ecology “pick & pull” auto junkyard, plunk down $2 for my entry fee, and simply wander around through the aisles of parted-out cars. I like to eyeball the interiors and look specifically at the gauge clusters to see just how many miles each one traveled before being put to rest in the graveyard. Occasionally I’ll come across something with fewer than 100,000 miles on it. 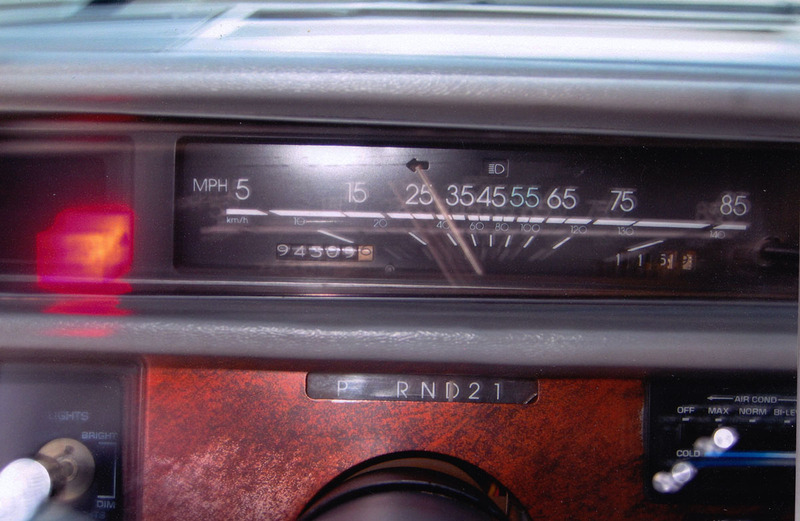 Most of the time the odometers are between 200,000 and 300,000. And every once in awhile, I’ve seen them beyond that – but never anything in the 400’s or 500’s. The thing that I wonder about, though, is what kind of story each car would tell if it could talk. How many of those vehicles have ever had “Just Married” painted on them? How many were driven by a zealous 16-year-old as his or her first car? How many ever took a cross-country trip from one coast to the other? How many of them were ever stolen? Or, a more somber thought, how many of them became witness to their driver’s death in a collision? Many people today buy a car without ever having thought of its prior ownership history. For me, such history is a hugely important part of how “good” a used car is. 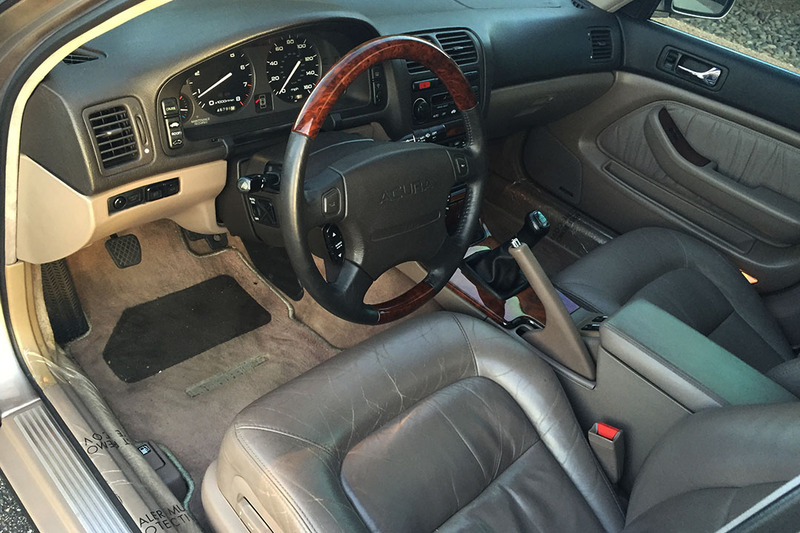 I go crazy for a clean car for sale by its original owner, with a stack of detailed maintenance paperwork, a clean title, and some original floor mats. Mmmm. It’s scary to think of buying something without any kind of record. There are, however, ways to at least know something about where any car’s been. 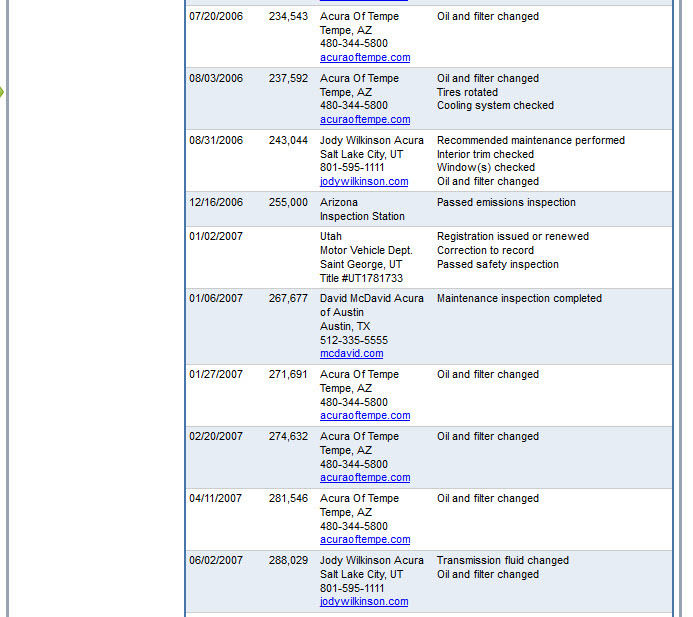 Carfax and Autocheck are companies in business to provide that kind of reporting. Carfax has been around since 1986. The company has access to 10 billion records from 86,000 sources (motor vehicle departments, auctions, insurance companies, repair facilities, etc). With just a VIN or a license plate (and a credit card), regular consumers can pull vehicle history reports from those billions of records. Carfax is certainly not a complete record, and it should only be considered for a used car purchase in combination with other research. 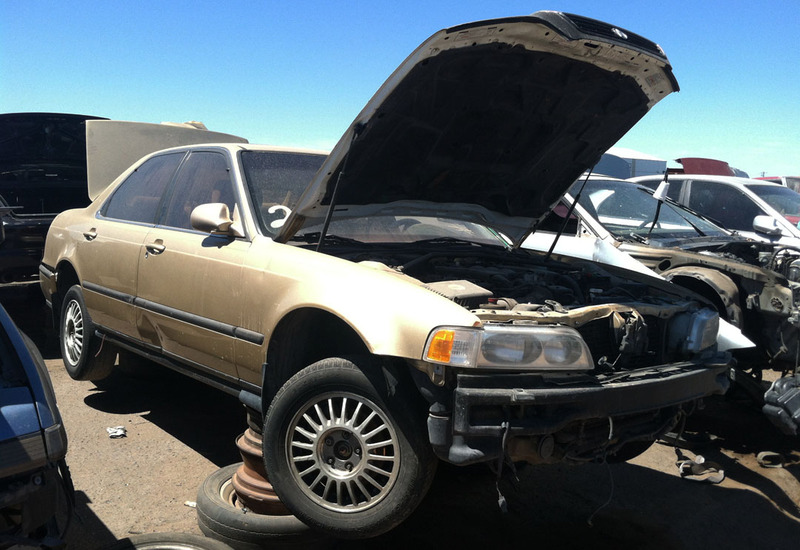 As I’ve been casually in the market for a 1992-94 Acura Vigor, I grabbed a $45 Carfax account and started running reports on a few prospective cars, including the above pictured beauty (sarcasm). 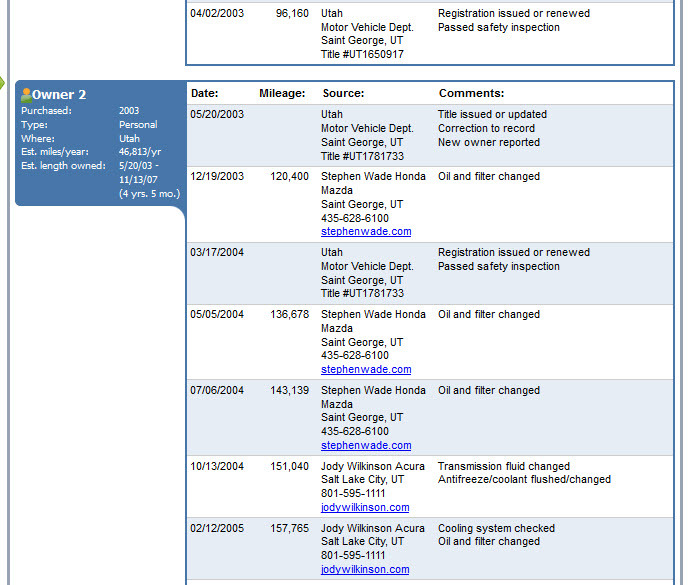 My account gives me access to UNLIMITED reports by license plate / state, or 5 reports by 17-digit Vehicle Identification Number (VIN). I had some fun with this. One Vigor showed record of a whopping 13 owners in its lifetime. I ran some of my friends’ cars for the heck of it, too. I also checked out some of my “old” cars to see where they ended up. I was intrigued by the report on my first car: the 1986 Chevy Celebrity that was my pride and joy from 1997-98. 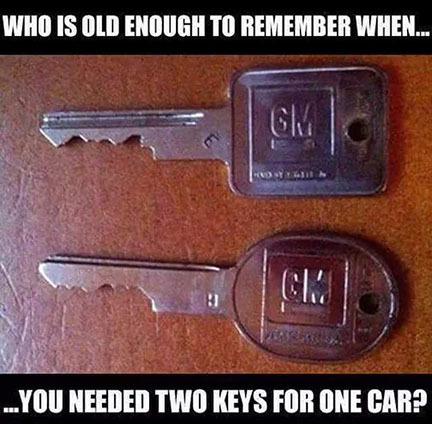 I laughed the other day when I saw this picture on Instagram because the keys shown there are exactly what the keys to my Celeb looked like (square for the ignition, round for the door & trunk locks – I think). 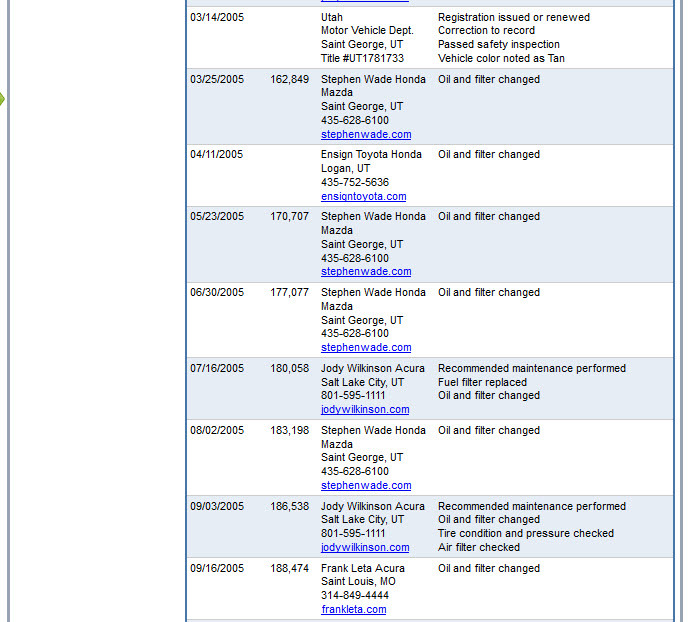 I know my parents bought the car new in 1986 from Axtell Chevrolet in Logan, Utah. But the first record on Carfax wasn’t until March 1994 with an odometer reading of 555 miles. Say what? Yes. The odometer on that Celebrity only had 5 digits. So, by the time the car was only 8 years old, it had already turned over to 00,000 and made any future readings erroneous. Utah noted that fact on the Celebrity’s report. The car’s title was branded with “Exceeds Mechanical Limits.” Can you imagine if my ILX only had a 5-digit odometer? It would have rolled over once already and it’s a 2-year-old car. By the time I got the Celebrity, it had around 194,000 miles on it. But of course, the odometer read only 94,000. 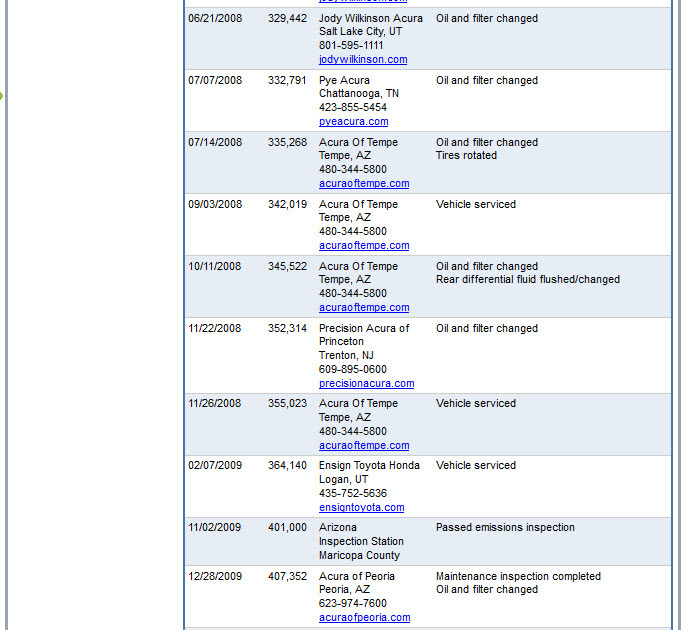 That Celebrity dropped off Carfax reporting a decade ago, since the last record was a purchase reported in March 2005. I’m sure the car has long since been crushed and turned into scrap metal. 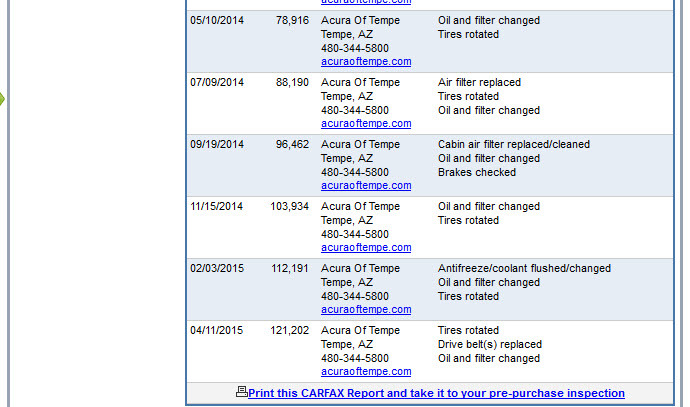 I thought it would be interesting to go ahead and share the detailed Carfax reports for my Legend and for my ILX. The Legend’s history is tainted so it’s a little unnerving to post it here, but it’s all in the interest of a good history lesson. Some of you may know that I hit two deer with the Legend in summer 2007. 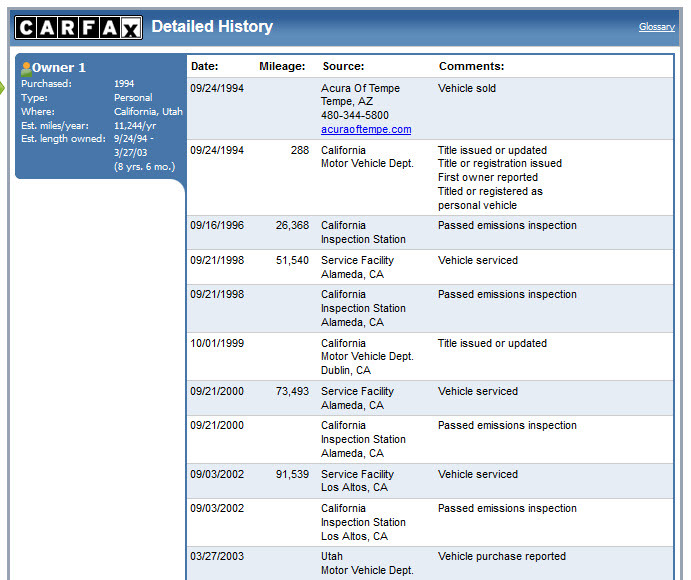 It took almost six years — until early 2013 — before that insurance claim started showing up on the Carfax report! My car’s title today is clear. 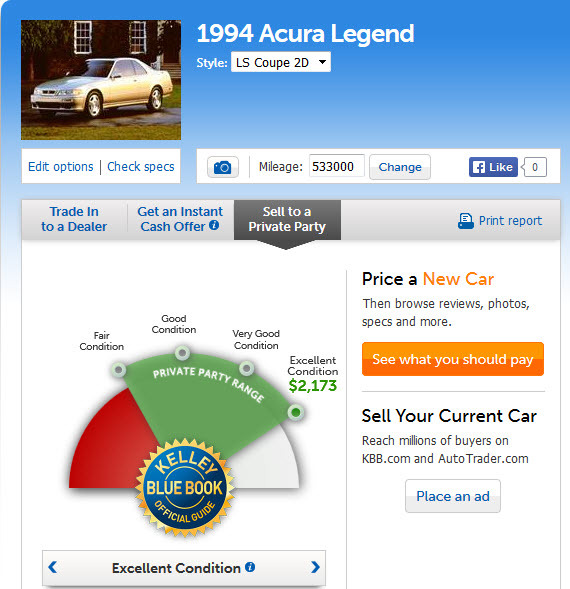 There are a whopping 77 service records, and oddly enough, Carfax thinks my Legend is actually worth about $2,600 MORE than retail book value! That means I could price it at about $4,700 since “excellent” condition value is $2,173. 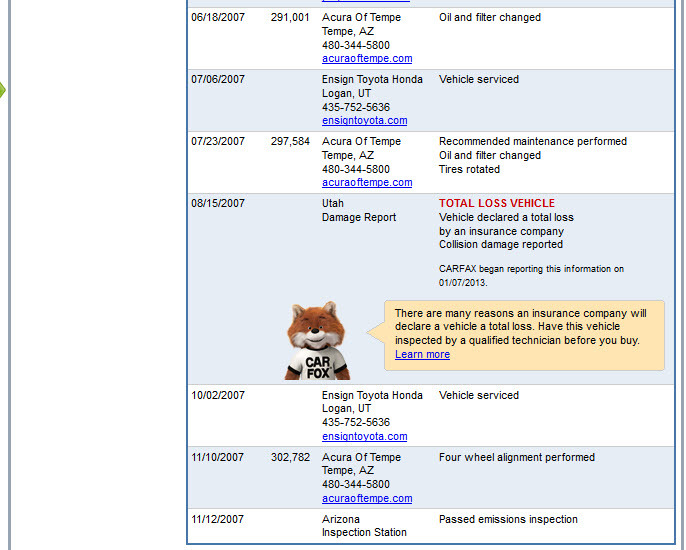 It took me 11 screen captures to get the full Legend Carfax report. Here you go! Then there’s the ILX. 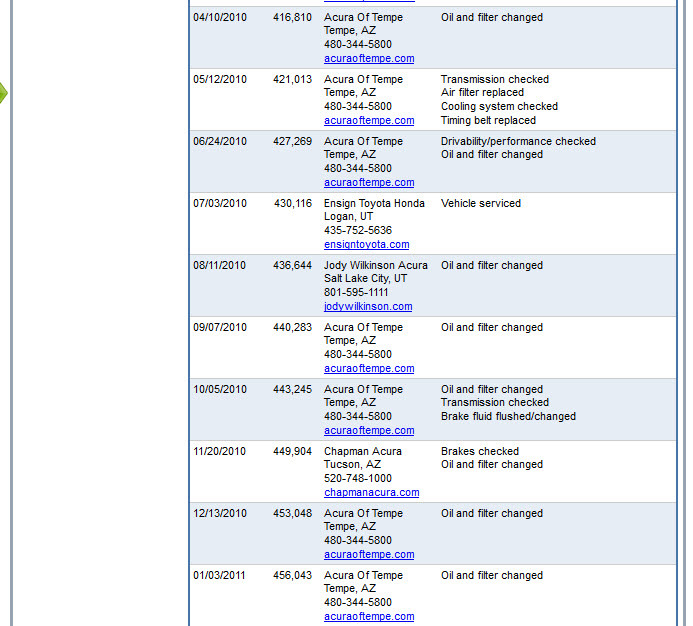 Clockwork maintenance from Acura of Tempe, and not much else. There’s one more Legend record that’ll be showing up soon. 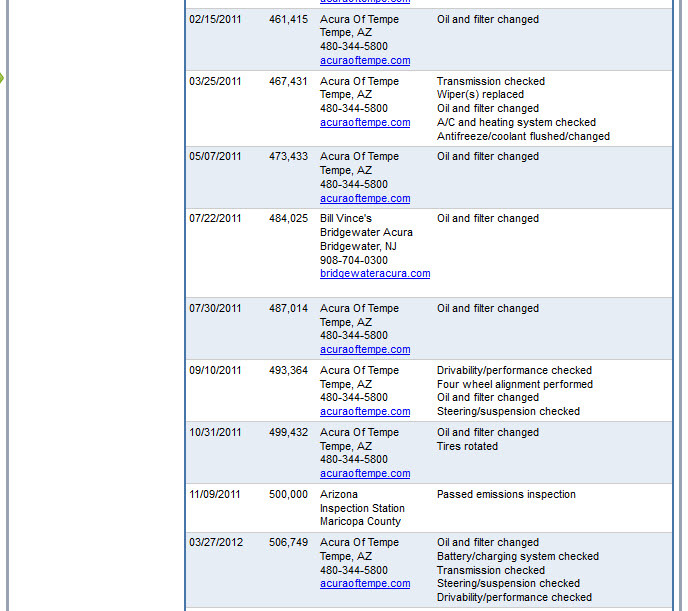 I got a $41.23 oil change on Wednesday with 5W30 synthetic blend oil at Acura of Tempe. 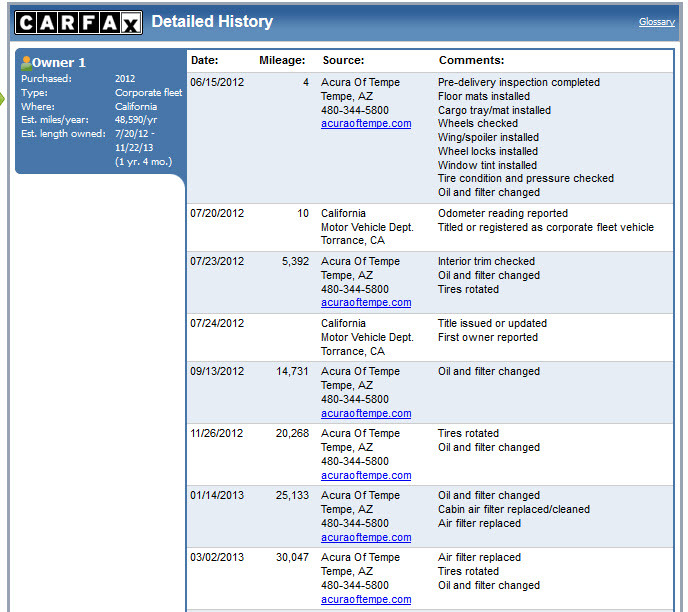 It had been over 6 months since my last service, but only 1,703 miles. I really hadn’t driven the car much since last fall! 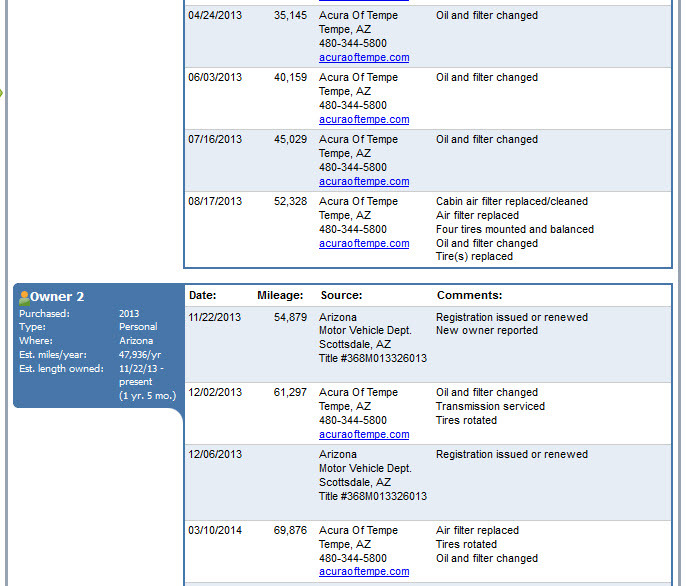 Here’s the latest snapshot from my Excel maintenance record showing service and repair costs since about 512,000 miles. The technician did note a number of leaks, including the differential, transmission, driver side inner CV boot, and rear main seal. This all does come as a bit of a surprise though since my garage floor is squeaky clean and I’ve never noticed a drop in any fluid levels. 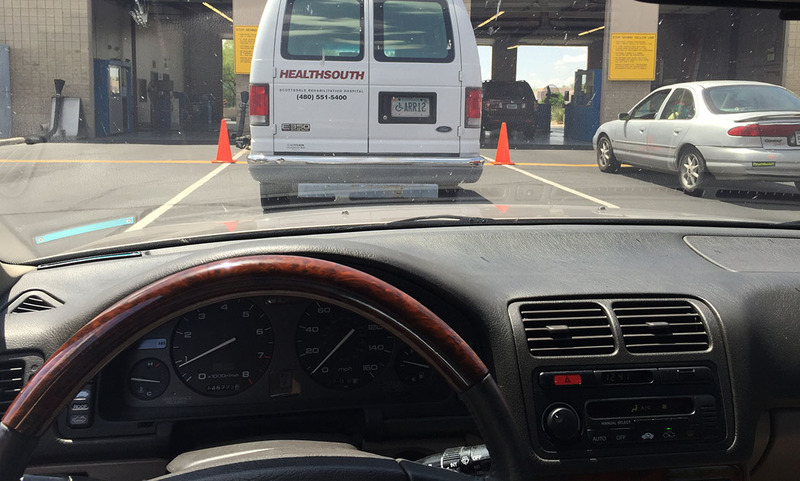 Today during lunch, I took my Legend GS sedan for its emissions (“smog”) testing. The test is required once every two years and it evaluates the levels of pollutants in the exhaust output. The wait was only about 20 minutes. It passed, I was issued my certificate for a $20 fee, and I went on my way. My 2-year renewal registration with the State of Arizona was only $95, and $50 of that was because I have a personalized tag. It really is a cheap car to hang onto. I gave the car a bath before putting it back into storage. Oops, should have pulled out the vacuum. This entry was posted on May 7, 2015 at 9:59 pm and is filed under Blog, ILX, Legend, Maintenance. You can follow any responses to this entry through the RSS 2.0 feed. You can leave a response, or trackback from your own site. First! Nice post here, Tyson. 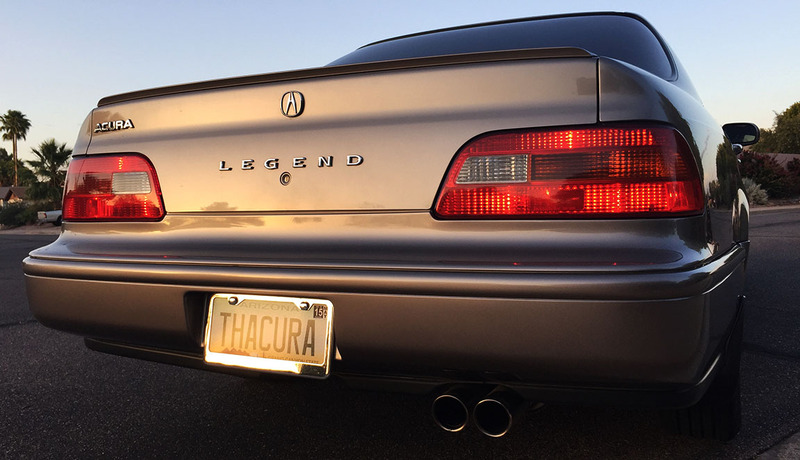 That Legend Coupe sure has seen a lot of care. I love how CF shows the inspection right at 500,000. NICE! Any luck on the Vigor search? I’m guessing those crumbs/dirt in the Legend Sedan are from me. 😀 I freakin’ love that car. Happy Friday and may the road stay open for you this weekend. Very interesting stuff! I hope you find the Vigor you want. I don’t suggest searching for one up in these parts. Think rusty Vigor carcass…. Believe it or not, I considered a Vigor out in those parts – my friend Ruben sent me the craigslist link last week. 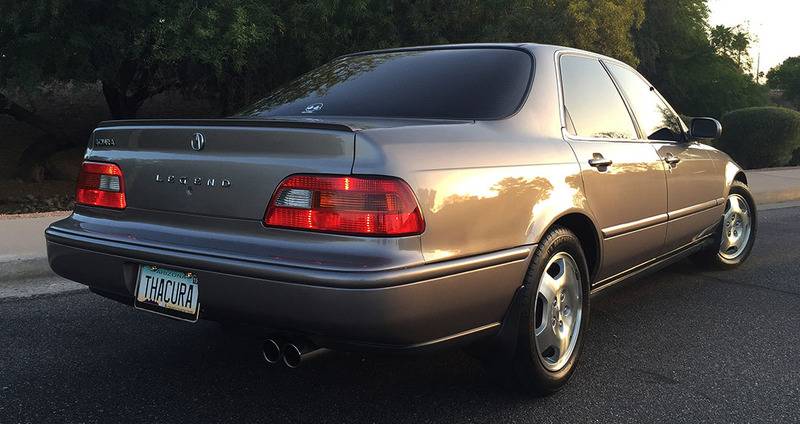 It was even Desert Mist Metallic – same color as my Legends. But alas – that quarter panel rust was unsightly. Keep an eye out! 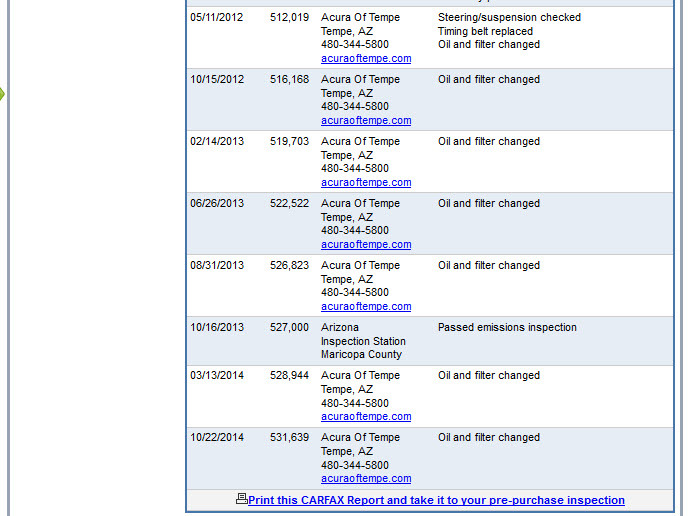 Carfax reports surprisingly can be fun to look at. 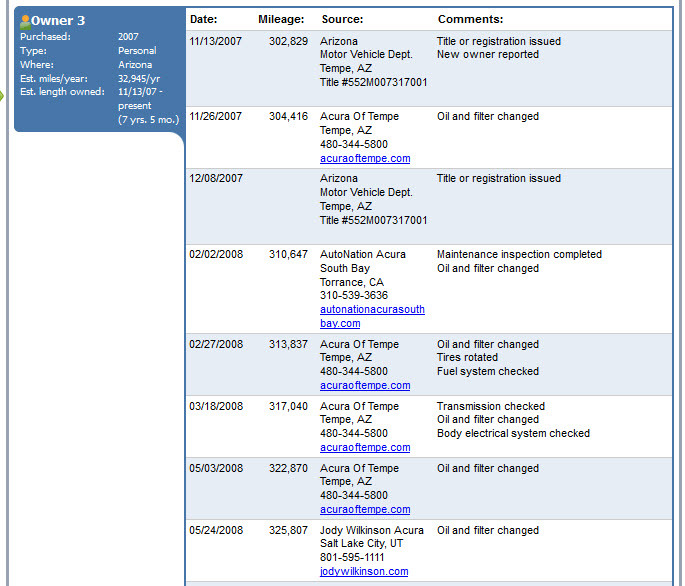 I had the opportunity to get reports for all the cars in my family a while back. It was quite a fun read seeing how much stuff actually gets documented. Also, with the addition of a Vigor to your Acura family, all you need is an Integra and you are all set for showcasing 90s Acura in your garage! Didn’t you own a Vigor before? Yeah I love reading up on car history. Yes – for a very short time I owned a white 1993 Vigor GS 5-speed. It was a riot. I’m really holding out for Arcadia Green, Royal Plum, or Granada Black. Keep your eyes and ears open. And yes – I will also be getting a 1992-93 Integra GS-R to complete the early 1990’s Acura fleet 🙂 Hope you have a great weekend. This Carfax is pretty nifty. 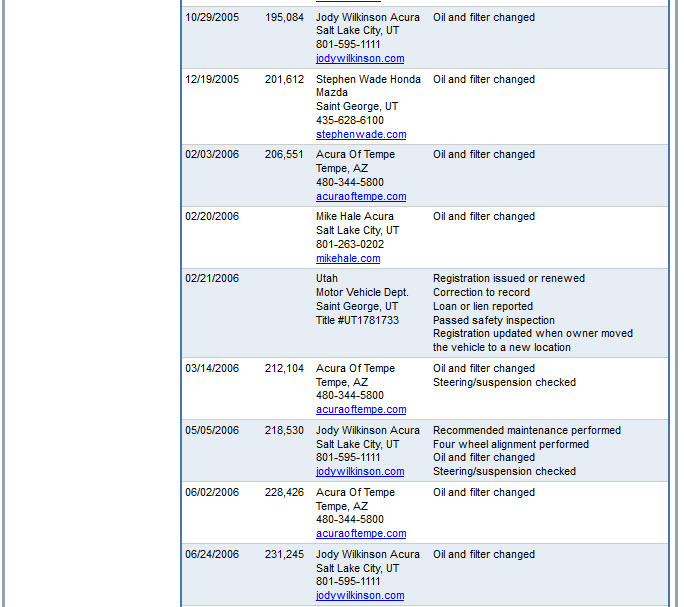 Amazing you can see all the maintenance records… which reminds me I should probably take the Kia in for service. Get it scheduled! How many miles do you put on the Kia each year? Probably less than 2000 miles a year. I had it serviced last Nov. It was due in February at 51k miles but I only have 49k on it. yay! Sedan love! I’d love to see the CarFax on my first G1 sedan I had back in 2004. I sold it to a guy in Los Angeles that was giving it to is son for his long commute. I suppose if you still happen to have the VIN to that car we could track down its current status… Let me know! 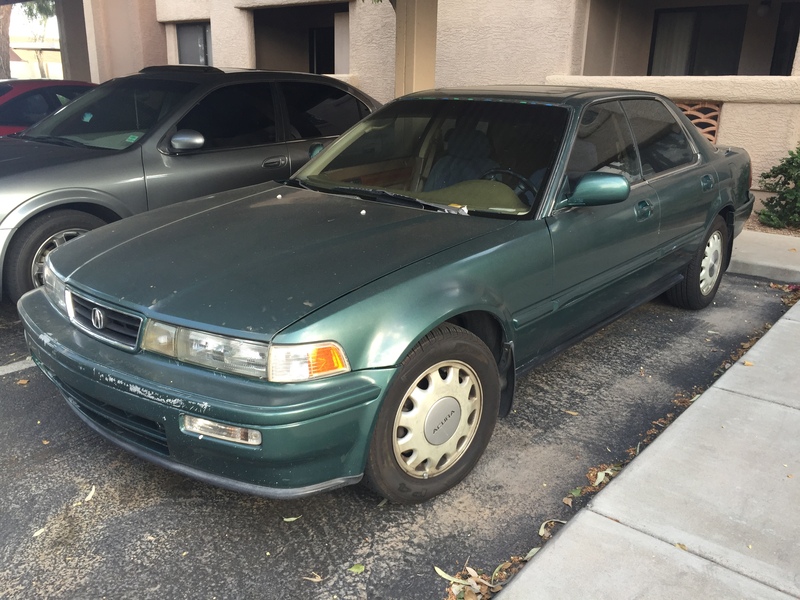 I just picked up a 94 Vigor GS 5SPD (been looking for one myself)! Found it on CL for just $400 and the body is super straight but is need of restoration (along with the interior). The most interesting part is the drive train: inline 5, passenger side axle runs through the oil pan while being longitudinally mounted (like the Legend) delivering a near 50/50 weight distribution. 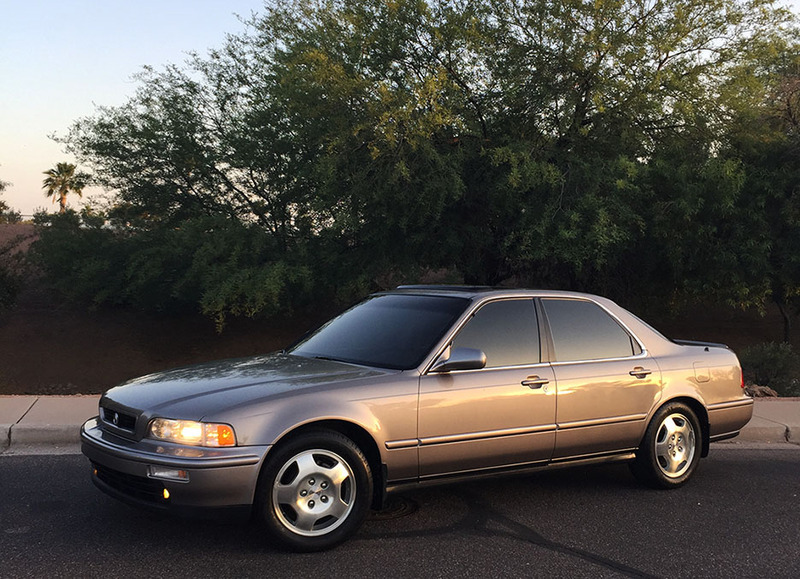 I’ve owned a 91 Legend Sedan and 95 LS Coupe in the past and this brings back so a lot of memories. So – getting to the point – i feel a Vigor would be a nice addition to your collection. Such a unique car. Just dropped off the front seats at a seat shop to be recovered (leather w/ “Vigor” logos). Now just to convince my TL it will not be forgotten about! Hey Jason, thanks for checking in. Wow, congrats on your Vigor! You got a great deal on that. I’d love to see some pictures. Keep eyes and ears open for a good one for me. For sure – Pictures coming soon. I wanted to ask where did you score that wood steering wheel for your sedan? Was it a factory extra? Thanks! The wood wheel was made by a company called Craft Customs in Texas and it cost about $500. I had them match it to my woodgrain.